A year ago I couldn’t find bok choy anywhere other than a small little Asian market on the east side of Allentown. It’s slowly made its way onto menus all over the place. I’ve had it at 5-star restaurants and none of those dishes compare to the simplicity of my mommas. This is one of my absolute favorite dishes that I learned from my mother. 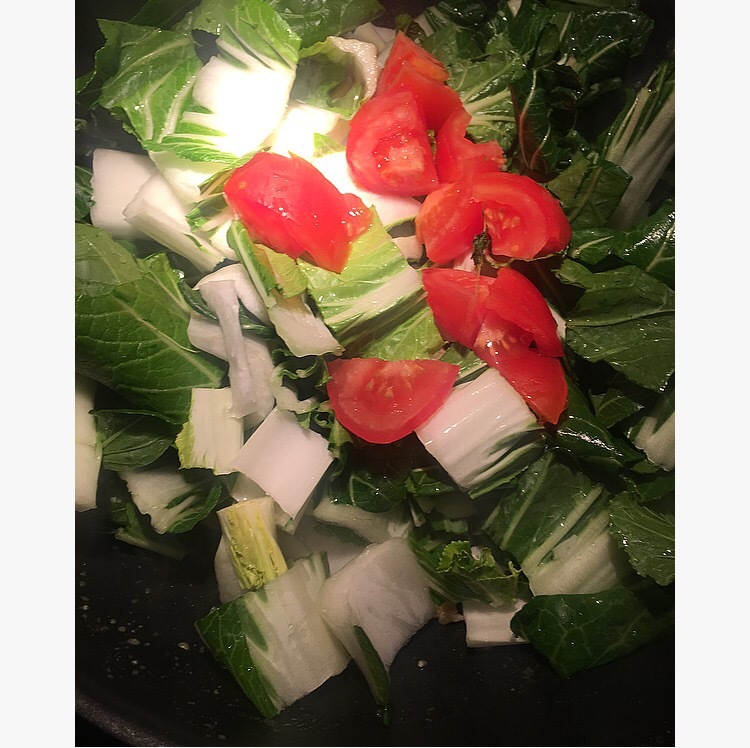 Boy choy is “Chinese cabbage” and has a very soft flavor. The healthy and delicate leafy green paired with some lean chicken breast and simple seasoning make it a go to dish. I actually got this bundle from Giant Supermarket so it is out there! Whenever I can get my hands on some I just need to make it. Baby bok choy is exactly the same just smaller and has the same flavor so if you can’t find regular bok choy, go ahead and get the baby ones. If you don’t have any of these seasonings separately, use 2 tablespoons of Adobo! Yes, it’s the same exact thing. 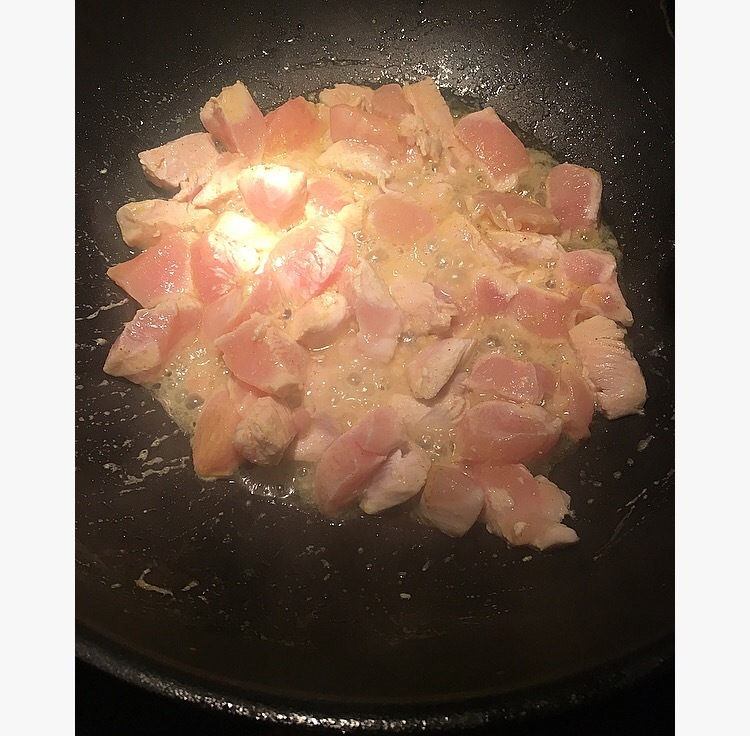 In a large skillet, pour enough oil to lightly coat the bottom of the on and cook your cubed chicken on medium high heat. Season the chicken and let it cook until the chicken is fully cooked through. Roughly 7-10 minutes. You’ll notice all of those delicious juices coming from the chicken and that’s exactly what you want. 2. 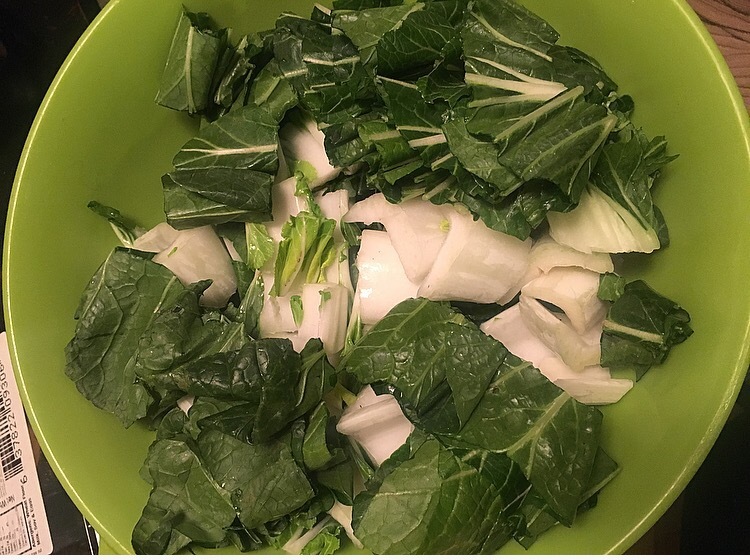 While your chicken is cooking, wash and chop your bok choy into bite size pieces about 1inch. Make sure to chop the very bottom of your bok choy off as it tough and bitter. Just the bottom inch, the rest of the white part is okay to keep. It does not have to be completely dry! The water will add moisture. 3. 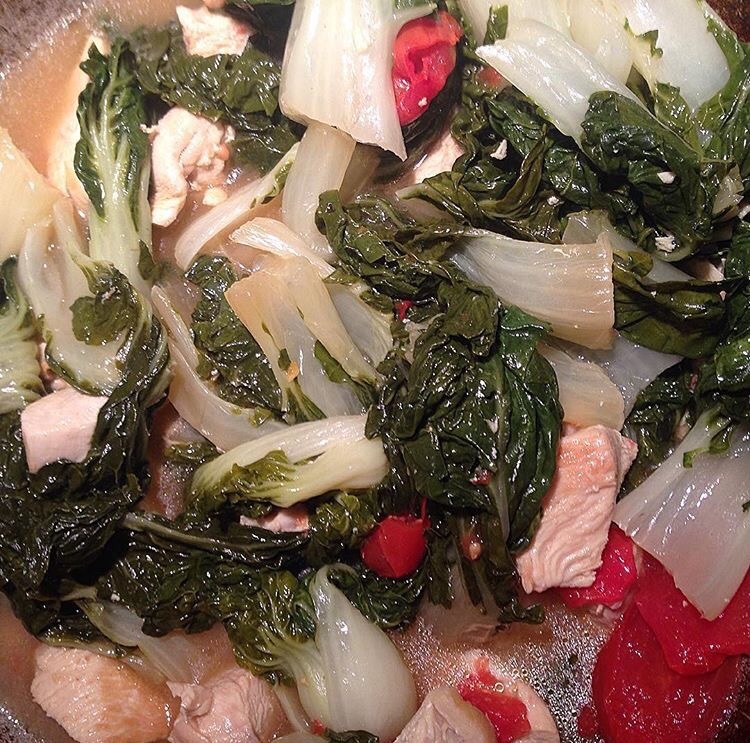 Once your chicken is cooked, lay all of your washed bok choy right on top of the chicken. Add a teaspoon of salt, your chopped tomato and put the lid on and cook on medium high for 10 minutes. The bok choy will cook like spinach and welt down to nothing so don’t worry if the pot looks over crowded. It will cook in all of that delicious chicken juice and become nice and soft. 4. Open up your lid and you will have steam deliciousness! With the lid close the chicken will also have a chance to steam and become very tender. Such a simple dish. Serve over rice or all by itself.